Just beginning work on ancient Rome? Read the basic Roman history article, or start at the beginning with the Etruscans and the foundation of the Roman Republic. Doing homework or writing a paper? See our articles on the wars between Carthage and Rome, on Caligula, on Constantine, the first Christian emperor, and on the fall of Rome. 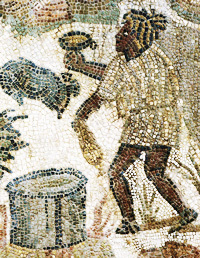 For Roman daily life, check out our articles on Roman food, clothing, games, and schools. Looking for something more specific? Quatr.us Study Guides also includes articles on Agrippina the Younger, gladiators, the Roman economy, Roman kitchens, charcoal, sewing needles, the invention of knitting, Trajan’s Markets, and much more! Did the Romans use makeup? What is a barrel vault? What is a Chi-Rho symbol?